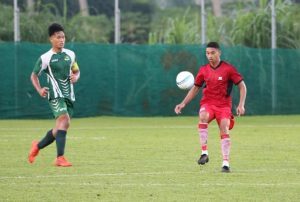 Tonga Football Association has been prepared our very own Under 19 Men’s team to participate in the upcoming OFC U-19 Championship 2018, Qualifying Stage which is scheduled to kick off in the Cook Islands on Saturday 26 of this month. The Tonga team final meeting here in Tonga was with the Tonga Football General Secretary / CEO, Lui ‘Aho before they flew out, for final messages and praying session at the Loto-Tonga soccer center. ‘’You are about to leave, I wanted to remind you all the reason of your travel, is to represent our country, Tonga. You are not going because of your club or your school but you are going to represent Tonga in this championship,’’Aho says. ‘’In order to win, you must be together as a team, work together, play together, think the same, and feel for each other,’’ ‘Aho added. ‘’May the Lord guide you and protect you on your flight to and back, and to give you strength so you could play well and win in this tournament,’’he said. The Tonga team has been in camping for the last two weeks and now they are heading to the Cook Islands. The Tonga team have few international players in their ranks like Anthony Likiliki, ‘Alipate Tukia, Vai Lutu, Lei Tu’ifangaloka, ‘Ofa Kite, Tuikaepau Falepapalangi, Kalakaua Faiva’ilo, Pesamino Tomasi, Sione ‘Auka Pepa, Fonua Talia’uli, Tevita Sili, Semisi ‘Otukolo and Mohammad Rajani. The team head coach, Soane Mailangi is so pleased with his squad because the most of them played in the last Under 17. ‘’Since I was called to be incharge of the Under 19 squad, I studied and found out most of these players started with the Just Play program when they were 7 and 8 years of age and they continued on,’’ Mailangi says. ‘’I wanted to give the credits back to these boys for following the player’s pathway, which they contribute to make my job easier, he added. ‘’When we finalize the team, I told the squad our aim is to qualify to the next stage, and we lift our preparation,’’ Mailangi said. ‘’So we are now ready, and I am also glad that I identified a lot of changes in their attitude on and off the field’’. The Tonga team will commence their campaign with the host country, Cook Islands, American Samoa next than with Samoa. The rest of the Tonga team officials are, Fililangi Ta’ai,(Team Manager) Erwin Vaifo’ou,(Assistant Coach) Motekiai Faupula, (Goal Keeper Coach), and Kilifi Uele,(Technical Advisor).